Student groups on Orlando getaway will definitely want to make room on their plate for a visit to the magnificent Orlando Science Center! 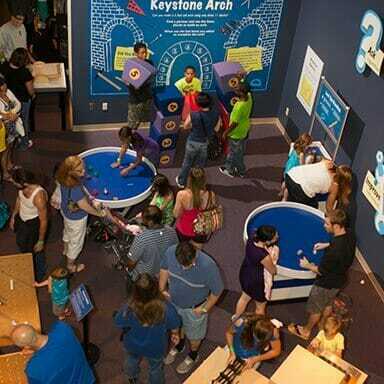 The new facility, opened in 1997, boasts four floors of prime exhibit space and was the design concept of talented, creative professionals working with the Science Center staff to pioneer truly innovative display environments for the very best in immersive and entertaining guest experiences. The science center provides interactive educational opportunities both within and outside the center’s walls, including field trips, family science nights at schools and community centers and other outreach. Giant Screen Film experiences will astound you with images of extraordinary clarity and depth that expand beyond your peripheral vision in the gigantic, 8-story Dr. Phillips CineDome; Digital Adventure Theater: A National Geographic Experience, presents Hollywood movies and educational features shown in stunning, immersive 3D and ultra-high definition 4D! Science Of Star Wars exhibits artifacts from the six mega-hit Star Wars films, along with a Millennium Falcon flight simulator and various intriguing and informative space exploration and medical technology displays. Crosby Observatory on the museum’s sixth floor houses Florida's largest public refractor telescope as well as an array of smaller but very powerful telescopes strategically arranged for guests’ personal star gazing sessions. Unique Science stations – a fusion of wonderful exhibits and live programs - provide visitors an in-depth, entertaining look at their respective subject matter , while exhibit halls like Dino Digs, Our Planet, Our Universe, Science Park and Nature Works make learning about everything under the sun a grand, hands-on adventure! Science Live’s special programming follows novel monthly themes, drafted to inspire curiosity and exploration, bringing the exhibits to life in ways reaching far beyond the scope of your wildest imaginings! Join in an Alligator Meet and Greet, feed a vibrant coral reef community and explore the awesome science of… explosion!